Cost to install a porcelain tile countertop varies greatly by region (and even by zip code). Get free estimates from countertop installers in your city. Cost to install a porcelain tile countertop varies greatly by region (and even by zip code). The cost of installing a porcelain tile countertop is $1,200. How much does it cost to install a porcelain tile countertop? There are many materials a homeowner can use for a countertop and one of the trendy materials favored by homeowners is porcelain tile. This material comes in a variety of styles, colors and sizes, making it a very versatile option for countertops, which can add color and dimension to your kitchen. The average cost for a porcelain countertop 30 sq.ft. including labor and materials with a cutout for a sink, and backsplash 1 is around $1,200. Factors affecting the cost include the size, colors, style of the tile, and whether you include a backsplashes 1, corners, cutouts for sinks or stove tops, what type of edging you use, as well as the ultimate size of your counter. Porcelain tile is made from clay dust that has been compressed under extremely high temperatures. The result is a color-through body tile that is impervious to water, stains, or scratches, and which can come in a wide range of different color and pattern options. Porcelain tile can be very beautiful, taking on the look of stone, marble, glass, fabric, or even metal, and comes in a variety of colors as well. In parts of the country that use tile counters on a regular basis, including the Southwest, porcelain is beginning to make serious inroads as a viable countertop material. Porcelain tile costs around $2-$25 per sq.ft. with most homeowners paying around $5 per sq.ft. plus setting materials and backerboard. The factors that play a role in this price discrepancy include: the thickness of the tile, which starts at ⅜-inch thick, and may go as much as 1-inch in thickness, the design, where it is manufactured (several are imported from Spain and Italy, driving up the cost due to transport), and the finish. There are many advantages to using porcelain tile. The list below is quite convincing. Porcelain is rated for indoors and outdoors so you could have design continuity from you kitchen to your outdoor space. Porcelain comes in many different colors and patterns; it can have a solid look or a more textured stone-look like marble, quartz, or other stone. It is fired at extremely high temperatures making it durable, heat resistant, and non-porous, as well as 30% stronger than granite. Porcelain is extremely low-maintenance. It requires no sealing, and can be washed with any material. It will not scratch, burn, or chip, and is ideal for busy kitchens. Like any tile countertop, porcelain tiles will require grout 2. Grout 2 may stain or require more maintenance or sealing than the surrounding countertop. Depending upon the size of the tile you choose, you may also need to deal with special installation to prevent conditions such as lippage where the corners of the tiles stick up, creating an uneven surface. Porcelain is also more expensive than ceramic tile; a ceramic tile countertop typically costs around $620, far less than a porcelain counter. While porcelain tile install just like ceramic, the size of the tiles can present some issues to DIY installers. Porcelain is much harder to cut, requiring a wet saw, and may require backbuttering to install. Therefore, it is always best to have a professional installer put in your porcelain counter. 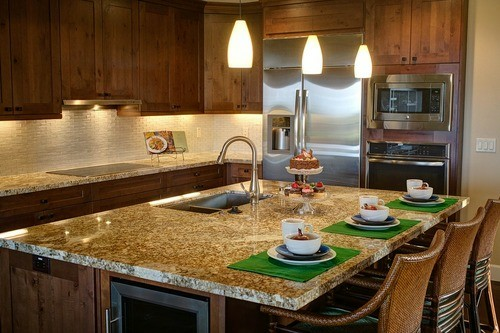 Labor is typically the smaller portion of the whole cost to replace your countertops. Labor prices can range from $4-$6 per sq.ft. to as high as $12-$15 per sq.ft. for materials such as tiles or smaller mosaics. The average kitchen has about 30 linear feet of countertop space. Countertops are typically 19”-21” deep. At 19” it would be come out to be 47.5 sq.ft, so the labor to install porcelain in an average kitchen with 30 linear feet of space would $190-$315 for a low end installation and $570-$787 for the higher end. Most porcelain counters will require a drop-in sink installation. However, you can undermount or tile-in a sink using specially bullnosed tiles around the opening. This can increase your total installation cost by around $200 to $300. A backsplash 1 is easy to incorporate with your new countertop; using the same material on the counter and backsplash 1 is both cost effective, and makes your kitchen look larger. A backsplash 1 will cost $600-$720 for a typical kitchen with 30-40 linear feet of backsplash 1. Installing end caps 3 or other trim pieces ($4-$150 per linear foot) is also a possibility. One example would be to cover the whole end of a cabinet with the porcelain giving it a waterfall effect. When ordering your porcelain it is best to order about 10% more than you need; This is typical to accommodate normal wastage. For example, if you need 50 sq.ft., you should order 55 sq.ft. The porcelain is installed on an underlayment of cement backerboard to get it extra stability. Costs for a sheet of backerboard start around $20 a piece. You will need a minimum of 3 sheets to tile the counter for a total of $60. The National Tile Contractor’s Association (NTCA) has a 70 year history and a well developed network of contractors and installers who specialize in countertops and installations. Check with your area NTCA to see if they can lend a hand in finding an installer for your countertop project. You can also check out your installer by finding out if they are associated with the NTCA, to ensure you are getting a trusted resource for your kitchen counter installation. There are several alternatives to porcelain countertops such as ceramic tile ($20-$75 per sq.ft. ), concrete ($70-$140 per sq.ft. ), engineered stone ($100-$185 per sq.ft. 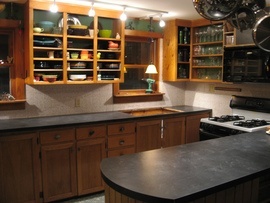 ), granite ($100-$225 per sq.ft. ), and marble ($125-$250 per sq.ft.). 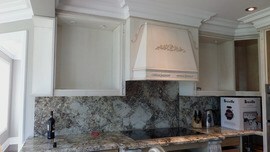 Check with your installer to see if there are any discounts for a countertop and backsplash if done at the same time. Installing both together is more cost effective than doing two separate jobs; less travel time, less transfer of equipment, getting the exact color match, and possibly a quantity discount. How much does it cost to install tile countertops? The average cost of a new porcelain tile counter is about $1,200, while the cost of a ceramic tile counter is about $620. How do you install tile? Most tile is installed over a cement backerboard substrate. Thinset mortar is spread and keyed over the substrate to an even depth, then the tile is placed and beaten in. Once the mortar is cured, grout is applied to fill the joints between the tiles. Can you put a tile backsplash over Formica? Yes, you can install a tile backsplash over Formica, provided you use a latex additive thinset mortar keyed to the right depth for the tile you are installing. How do you tile a kitchen wall? Lay out the tile on the floor in an area the size and shape of the wall to find the right pattern and make your cuts. 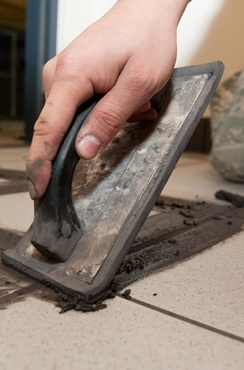 Spread thinset mortar onto the wall with a trowel, keying it to the right depth. Press the tiles into the mortar in the same pattern you determined on the floor, tapping gently into place. Let cure 24 hours, and spread grout over the installation. Tile floor installations range from about $700 to $2,000 on average for 200 square feet of flooring. Tile installation costs differ based on the type of tile and its location. On average, however, you can expect to pay between $3.50 and $10 per square foot installed. The cost of having porcelain tile flooring installed is about $900. How much is a floor tile? Floor tile costs range from $2 to $20 per square foot on average, depending on the type and size of the tile. How much does it cost to install a porcelain tile countertop in my city? Cost to install a porcelain tile countertop varies greatly by region (and even by zip code). To get free estimates from local contractors, please indicate yours. We have also added an image of the project, in this case of a porcelain tile countertop, to help the user better understand the project.